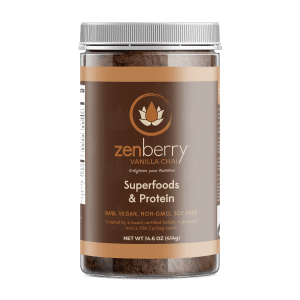 zenberry2018-12-31T12:57:32-04:00If you love chocolate chip mint ice cream but don't like the dairy, saturated fat and sugar, you'll love this recipe! It's hard to believe this smoothie is healthy, it tastes so good. 2-4 tablespoons Zenberry Greens 1 frozen Banana 1/2 cup frozen blueberries 2 kale leaves (spine removed) handful fresh mint leaves Ice if you need to make it thicker Blend in high speed blender. Top with cacao nibs for the crunch of chocolate chips.